GIE+EXPO can be overwhelming for anyone, whether you’re a seasoned tradeshow pro or a first time attendee. 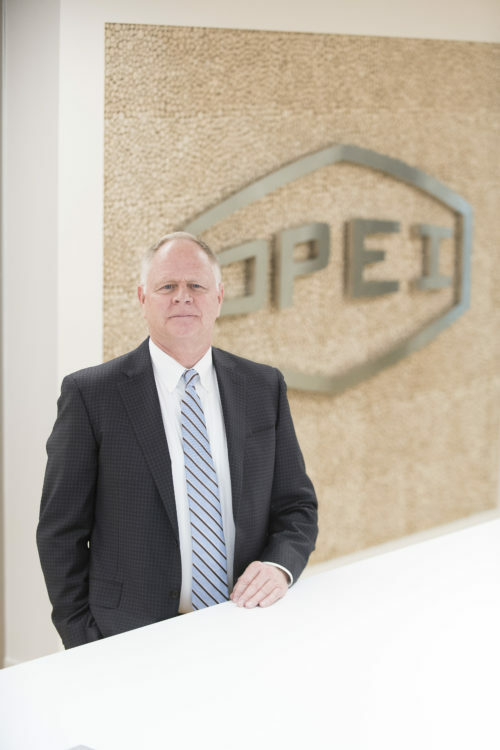 We got the insider scoop from industry pros across North America to make sure you don’t miss a beat at the biggest green industry show of the year. 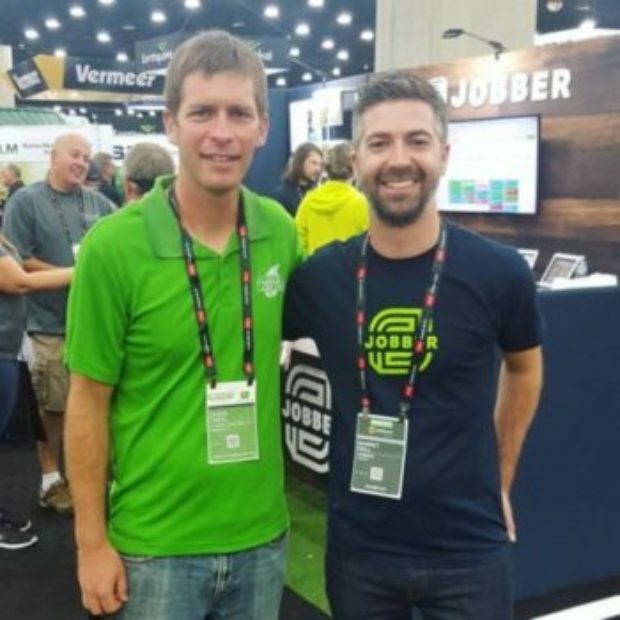 With the green industry show of the year right around the corner, we spoke with business owners in the green industry (Jobber customers and non-customers), associations, industry experts, and even some folks from the Jobber crew on everything GIE+EXPO 2018. Read on to get the full scoop of what to expect at the show and to get a first glance of what Jobber will be up to at the show. 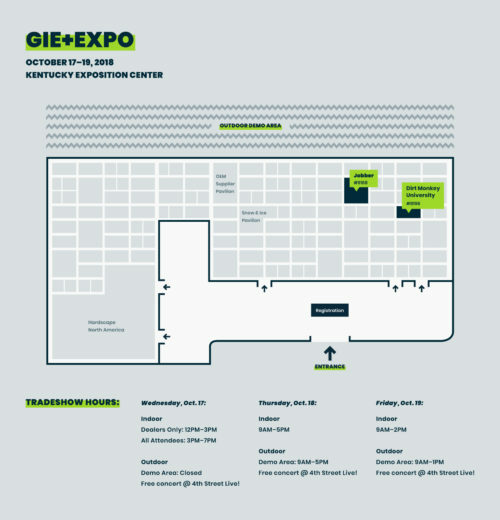 GIE+EXPO is the green industry’s largest showcase, taking place each fall in Louisville, Kentucky, covering more than 700,000 square feet of indoor and outdoor space filled with exhibitors, training and education opportunities, and hands-on demonstration areas, with an expected attendance of 24,000 in 2018. You can register for the show on the GIE+EXPO 2018 website. “I’ll say one thing, I went ahead and booked a room yesterday [Editors note: we spoke to Jason at the end of July] because the rooms book up quickly. My wife Traci and I ended up booking an Airbnb this year close by and we were really happy with our decision. “Caterpillar, Spartan, and Scag, and some other little things to add onto mowers, like shoot systems, leaf loaders and vacuums. We’d like to get more equipment for fall and spring cleanups”. GIE Rally, hosted by LCR Media, takes place on Thursday, October 18, 6-9pm at the Louisville Mega Cavern. Join other business owners, awesome brands, and industry pros, such as Stanley Genadek (Dirt Monkey University), Brian Shain (Top Notch Lawn Care), Keith Kalfas (The Landscaping Employee Trap), Blake Albertson (B&B Lawn Care) and many more. Food and event t-shirts will be provided for the first 300 through the door, and the Jobber team will be giving away shirts and other fun swag as well! “It’s changed over the years, to be honest. At first I wanted the exposure. Now I just go for relationships. I can go see the folks at Jobber, people that follow me on YouTube, and go to the GIE Rally. For me it’s more for going to the networking things. Originally I wanted to go for the big shiny toys. I know people who go pretty much every year because they buy new equipment regularly, and demo the latest greatest equipment. For me, it was never about that as I just do the weed control. Come find as at booth #9168 at GIE+EXPO 2018! 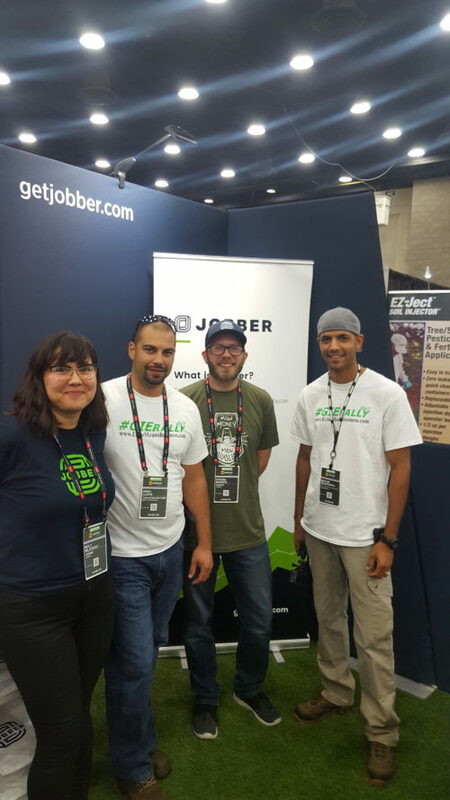 This year we’ll have a crew of eight folks from Jobber at the show! 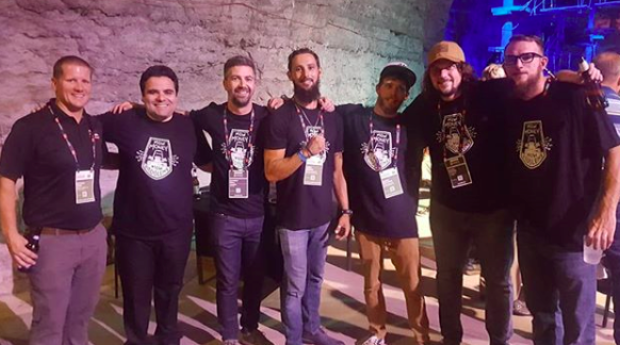 We’ll be having Q&A sessions with customers and industry experts, and we’ll be hosting Instagram and customer meetups—stay tuned with us on Instagram! 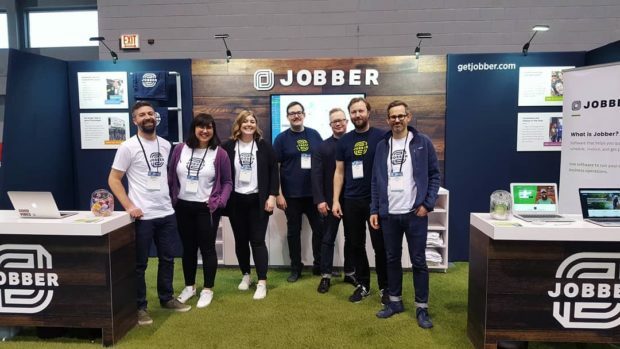 And of course we’ll be there to help answer any questions about Jobber, and to go over our customers’ accounts with them. The crew will also be heading to the GIE Rally on Thursday night for lots of opportunity to talk shop with industry pros, our customers, and other folks in the industry who might be new faces! 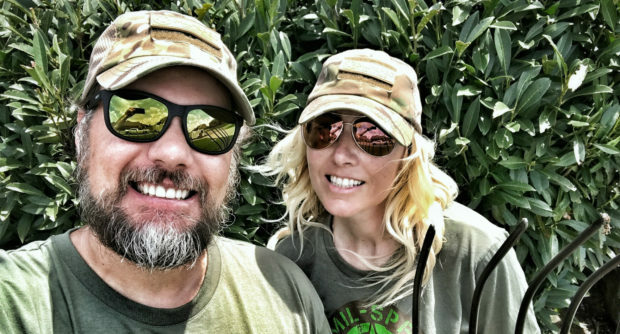 Brian and Kristy Boase from MIL-SPEC Lawn Care will be at the booth to go over their Jobber account and how they use Jobber as well. “There’s lots of little guys like us, and they’re just doing it by themselves that could be more efficient, or have 2 or 3 man crews that aren’t big dogs. So I think it’s good for even the smaller guys to see how beneficial Jobber really is right in person with us,” says Brian. Nick Keyko: I love the hustle of a tradeshow. Talking to existing customers, explaining Jobber to new customers, and checking out at all the new products that have come out in the last year. I’m also excited to check out the GIE Rally! Rebecca Kapler: This will be my first year at GIE+EXPO, and I can’t wait to experience all of the hype I’ve heard about the show! This will be Jobber’s fifth year at the show, and I’m excited for all our programming we’ll have surrounding industry experts and of course, our customers. It’s always so inspiring to meet customers face to face, walk through new features, and help other business owners—who aren’t already using Jobber—decide if Jobber is the best fit for their business. Oh, and I’m excited to check out all of this Louisville BBQ the team keeps talking about! What are your favorite Louisville food spots? Nick Keyko: Oh man. Hammerheads has become a Jobber cult favorite. Momma’s BBQ also kind of has history for me now. Steve Wegner: I’m with Nick on Momma’s BBQ! Moly Milosovic: Going to Hammerheads for BBQ is a Jobber tradition. It’s a little restaurant in the bottom of a house in a residential area with a shark above the door, and you wait on the sidewalk for your table. Their BBQ is so delicious, and my mouth is watering just thinking about it. What was your favorite thing about Louisville overall? Mark Cesar: The food! The best bbq I have ever had. The GIE Rally we went to in the cave was pretty awesome to meet other companies and vendors. 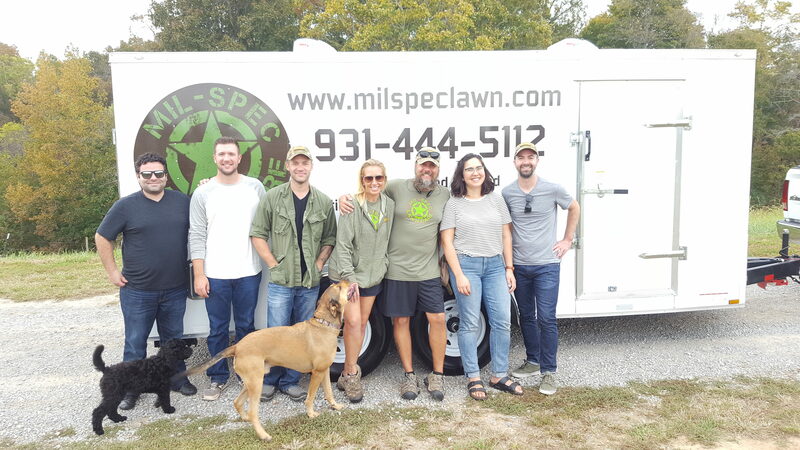 After the show we had an amazing ride along with our customers, Brian and Kristy from MIL-SPEC. Travelling with Moly and Barret is always a riot—Moly has quite the singing voice. Moly Milosovic: Going to GIE for the first time was my first experience with southern hospitality. The people in Louisville, wherever you go, are so nice and welcoming. What’s a must-see on the tradeshow floor? Moly Milosovic: The booths! Maybe it’s the marketer in me, but some of the big equipment and tool companies have pulled out all the stops to build the most amazing structures for the show. We’re talking two to three story high walls, revolving lawn mowers towering above you, super cool lighting—walking the floor is truly an experience. Nick Keyko: Jobber of course! We’re going bigger and better than ever before and it’s going to be awesome. Our good pal Stan, The Dirt Monkey, Genadek, is super close to us as well so that will be fun. You definitely need to try and find some time to try some of the new products outside too! Steve Wegner: Last year there was a really epic hardscaping display with a whole bunch of fake decks, etc., that was really cool. Thanks to all of our contributors who made this guide possible. We can’t wait to see you all at GIE+EXPO in October, 2018! Let us know what you think of the guide by commenting on our Instagram post below, and don’t forget to use the #roadtoGIE hashtag and tag us in your posts as you prep for the show so we can follow along!